An exhibit at the Lawrence Heritage State Park, commemorating the 1912 strike. Exhibits show the living and working conditions of the strikers. [In a couple of years, we’ll be commemorating the 100th anniversary of an extraordinary strike and victory. This article about the Lawrence, Massachusetts strike of 1912, adapted from a piece originally written four years ago for workers in one of the Midwest’s unions, embodies what the labor and arts festival has been “about.” Workers today are not strangers to the same issues that the workers of 1912 faced: gender discrimination, wage cuts, immigrant rights and many others. Many of the leaders of this historic battle were immigrant women workers, under the banner of Italian IWW organizers Joe Ettor and Arturo Giovanitti. Almost a century ago, thousands of men, women, and children shouted those slogans – in many different languages — in the bitter cold of a Massachusetts winter. 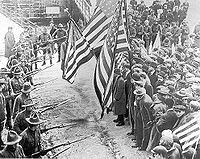 January 2010 marks the 98th anniversary of one of the most important events in U.S. labor history: the Lawrence textile strike. worsted goods. The woolen and cotton mills of the city employed over 40,000 workers – about one-half of Lawrence’s population over the age of 14. At the time of the strike, 44.6 percent of the textile workers in Lawrence were women. 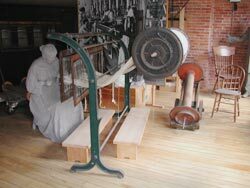 More than ten percent of the mill workers were under the age of 18. The Lawrence strike began as a spontaneous outburst, but the strikers quickly realized that they needed to organize themselves. At a mass meeting held on the afternoon of the strike’s first day, they voted to send a telegram to Joe Ettor, a leader of the Industrial Workers of the World, asking him to come to Lawrence to aid the strike. 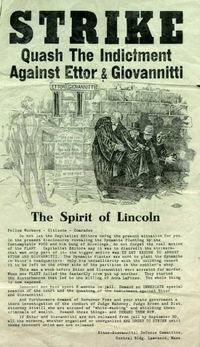 Ettor arrived in Lawrence the very next day, accompanied by his friend Arturo Giovannitti, the editor of Il Proletario and secretary of the Italian Socialist Federation. 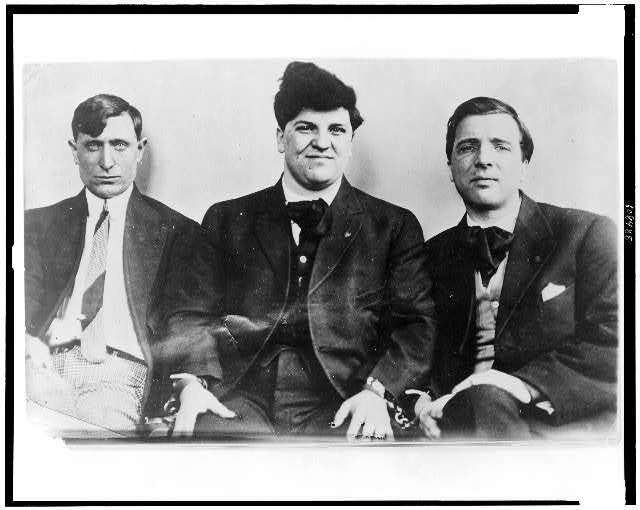 Caruso (l), Ettor (c), and Giovannitti (r), IWW organizers. They were all arrested in the wake of the strike. This photo shows them seated and handcuffed together. Under Ettor’s leadership, the strikers set up a highly structured but democratic form of organization in which every nationality of worker involved in the strike was represented. This structure played a decisive role in guaranteeing the strike’s outcome. A general strike committee was organized and a network of soup kitchens and food distribution stations were set up. The strikers voted to demand a 15 percent increase in wages, a 54-hour week, double pay for overtime, and abolition of the premium and bonus systems. The agents of the mill owners struck back. When the police and militia tried to halt a parade of about 1,000 strikers on January 29, a bystander, Annie LoPezzo, was shot dead. Despite the fact that neither Ettor or Giovannitti had been present at the demonstration, they were both arrested the next day. They were charged with being accessories before the fact to the murder because they had supposedly incited the “riot” which led to the shooting. That same day, an 18-year-old Syrian striker, John Ramy, was killed by a bayonet thrust into his back as he attempted to flee from advancing soldiers. two were speaking to a meeting of workers several miles from the place where Annie LoPezzo was shot. Across the United States and the world, concerned people expressed outrage at the prosecution’s attempt to punish two leaders for their ideas. The Lawrence textile strike took place at the time when the mill owners lacked maneuvering room because they had to maintain public support for a high tariff on woolens. That was certainly a factor in the workers’ victory. So was the fact that the textile workers comprised such a large percentage of the population of Lawrence. But those factors do not change the reality that the victory at Lawrence was won by the bravery and intelligence of the workers themselves.